With heightened restrictions on foreign funding, reporting on the Russian government’s repression requires creative social media projects. A contribution to the openGlobalRights debate on new business models for human rights. Ру́сский. 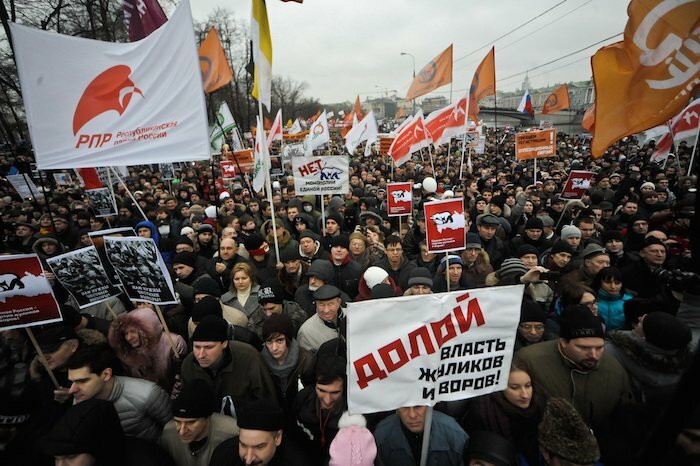 In 2011, Russia saw the biggest political protests since the end of the Soviet Union, with up to 100,000 people gathering to condemn alleged polling fraud in the parliamentary elections. In response, government security forces arrested thousands of protesters and jailed many key activists. This crackdown by the state inspired a wave of political activism and monitoring, but the government’s recent restrictions on foreign funding—including prohibitions on specific international donors—has forced organizations to seek out new ways to finance work that keeps the increasingly oppressive government accountable. Freedom of assembly and freedom of speech are especially critical issues in a climate where people are regularly detained for speaking out against the government. Freedom of assembly and freedom of speech are especially critical issues in a climate where people are regularly detained for speaking out against the government. By monitoring arrests and detentions, civil society can keep the government accountable and aware that their actions—and mounting human rights violations—are being exposed to the Russian public and the international community. In an initial response to the arrests in 2011, a group of volunteers launched OVD-Info, an online monitoring project to keep track of arrests and detainments during the protests. We put together the project in just a few days, as a quick response to the political unrest happening at the time. Between 2011-2012, OVD-Info tracked 5,166 politically motivated arrests at 228 protest events in and around Moscow. In the years following, the project has expanded to look at all issues of freedom of assembly and political oppression, collecting information, personal stories and data on people who have been detained. Post-election rally in Bolotnaya Square, Moscow, December 10th 2011. Because the state is unpredictable and generally tries to keep these stories out of public view, this type of work can be quite risky and the availability of funding is volatile. In the beginning, we were a small project run entirely by volunteers. When we began to expand, we acquired funding in the traditional NGO business model, by getting grants from donors, including international organizations. But in 2015, Russia passed a new law on NGO funding, which directly prohibited work with two of our major donors at that time, the Open Society Institute and the National Endowment for Democracy—labelling them “undesirable organizations.” Like many other NGOs around us, we immediately had to adapt and find new ways to fund our work. Given the political environment in Russia, gathering donations from private citizens might seem like an impossible endeavour. In addition, because of the sensitive nature of our work, NGOs working in this field are generally careful not to be too aggressive, as the state can change its policies toward us at any time. Nevertheless, crowdfunding in Russia for human rights issues is a rapidly growing field, and it has become quite popular for citizens to support various initiatives. We started our online campaign with Facebook videos, Twitter posts, and a “donate” button on our website linked to a landing page explaining what we do. We have also engaged with celebrities and well-known activists that are relevant to our Russia-based audience, such as journalists, singers, and human rights experts. The aim of these campaigns was not just to raise funds, but also to disseminate information on what is happening to people to speak out, and why it is so important to keep this government accountable. Our primary audience is composed of journalists and human rights activists, who then take our information and disseminate it to their constituents. Our crowdfunding campaign raised $2 million rubles in 2016 (approximately $35,000 US), and we now have an 11-person team with 50% of our budget coming from small, personal donations. But the challenge in this type of fundraising is that the models are always changing and organizations using crowdfunding must constantly adapt and be on top of changing trends and algorithms, which can be very daunting without the right expertise. For example, Facebook used to work very well—and is the still the major driver to our website—but changing algorithms have decreased our ability to reach potential donors. Twitter used to drive 15-20% of traffic to our site, but now it’s decreasing rapidly; we are trying to analyze this shift and adapt accordingly. We also get links from news outlets and Russian social media, and 10-12% of our traffic is direct to our website. It’s important to note that we measure success in our social media outreach not just in terms of money raised, but also in how well we are growing awareness in Russian civil society and expanding the reach of our work. When people are afraid of the government, it’s always easier to keep our heads down, and yet we are getting more quotations in the media, our website audience is growing, and our information is utilized in various other outlets and NGO reports. Like many NGOs, we want to work for the people and not for international funders; using crowdfunding allows us to completely circumvent the government—and their funding laws—to do exactly that. Russians are engaged in this work, speaking out and fighting back, perhaps more than ever. International audiences are also participating—for example, by making online donations or sharing our reports and linking to our social media posts. But since we’ve started the project, we have witnessed a decrease in freedom of expression and freedom of assembly. It’s hard to know whether this will continue to get worse, or how much we are affecting government behaviour—but this type of impact evaluation is not the point. Even in this space of shrinking freedoms, new business models allow us to remain relevant. Without the ability to evolve and seek new ways of funding, we and other groups like us would have shut down years ago. But Russian civil society continues to innovate, to engage the public, and to hold the government accountable—in whatever ways we can.